As guess what? I spilled my coffee this morning and missed out the toll road exit on the way home after picked up the kids from school. I think today just one of my messy day . Inside the box : (Red Box) rice stuffed with pork mince and small diced carrots, decorated with egg sheets on the top. 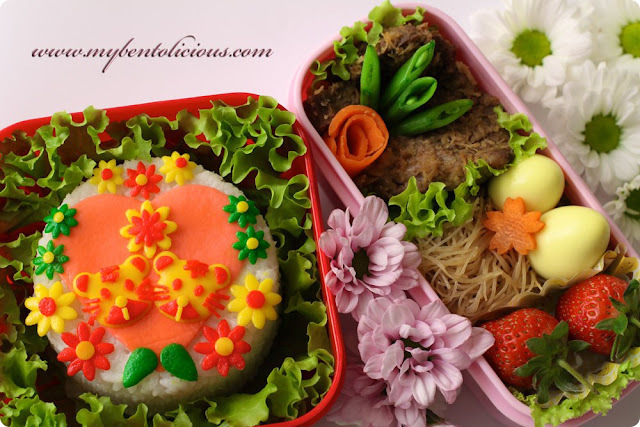 (Pink Box) beef coconut, pea pods, quail eggs, fried vermicelli, and strawberries. I think the cutie tigers and flowers are really pretty. The pink box also very nicely decorated. I think the colors look nice. 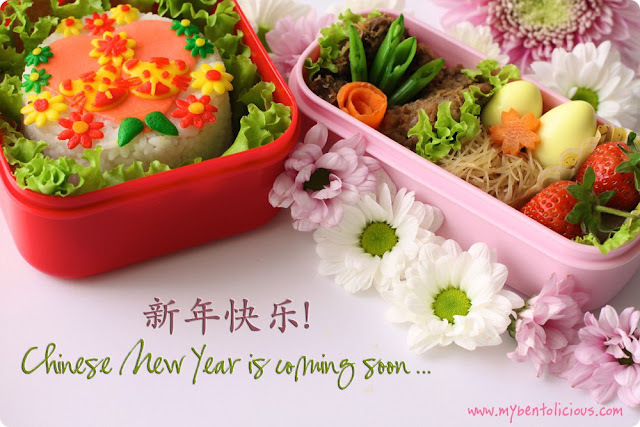 :) Lovely Chinese New Year bento. LOL! BTW, u have just reminded me that I haven't packed my red packets! It all looks gorgeous.. I love all the flowers everywhere ...especially the green ones! c'mon spring!!!! wow, was caught up in your garden of flowers :) then spied your two tigers, sweet. @javapot : hahaha ... lucky you didn't get lost somewhere :D Thanks a lot Javapot! The level of detail is so crazy!!! It's really really awesome Lia, I love it! This is amazing. Really amazing. You are so talented! Jenn : Thanks for your nice words Jenn! @susanyuen : Thanks a lot Susan! @Pikko : Thanks a lot Pikko! So cute! Love the flowers in the background. Great bento as always lia! I love this bento! The tigers are mini size but yet u can come out such a detail face feature. Great Job!!! Wow, you can do wonders with egg sheets, I can't even begin to understand how you have such steady and exact cutting!! Amazing!! I wish I could take a bento course from you!! @sherimiya : Sheri, I didn't cut the egg sheet free hand but I was using my cutter and straw. Now you know the secret hahahaha ;) Thanks a lot Sheri for being a very sweet bento friends. Gorgeous and a feast for the eyes as always! I enjoy looking at each special detail, and your color combinations always amaze me! Happy CNY!!!! What a beautiful bento box! Happy Chinese New Year :)!